In recent days, Iran flash floods have swiftly swept 25 provinces of the country, leaving enormous casualties and damages. Without any doubt, the responsibility of the recent disaster, simultaneous with Iranian New Year, and Nowruz holidays is on the corrupt and negligent clerical regime. Being located in a warm region at the northern hemisphere, Iran has been facing the crisis of shortage of water and drought in recent years. So the question is why this current course of raining has turned to flash floods nationwide ruining people’s lives and creating a national catastrophe. Since flood is one of the most common natural disasters, there have been many delving into it, and many countries allocate a proper amount of resources to control it. They have also taken measures to lessen their devastating effects. But in Iran under the rule of the corrupt despotic regime of the mullahs, plundering of natural resources, especially forests and pastures and ruining the natural routes of water streams and turning them into roads or railways to benefit trades, by mostly the IRGC elements, has turned a few days rain into devastating flash floods all over the country. 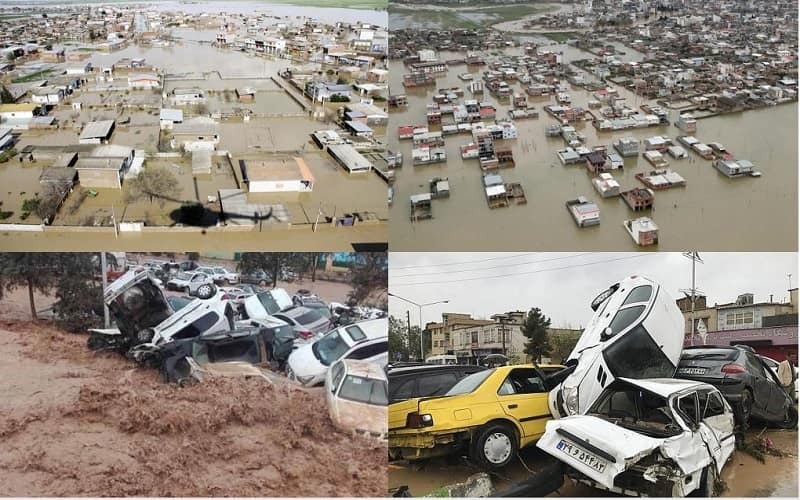 A few days ago, shortly after precipitations and winds, flash floods in Iran surprised people in many provinces and led to the loss of many lives and damages; particularly in the highlands and mountainous regions. But the question is about the dimensions of damages despite the progress of meteorology knowledge and increasing the capability of forecasting the weather condition. One of the main causes of floods in Iran is the destruction of nature by the Revolutionary Guards (IRGC) and the government-affiliated bodies. After hitting #Golestan, #Lorestan, and Sistan and Baluchestan provinces by #Flood, today we witnessed a huge overflow in #Shiraz. Some local resources reported that the number of casualties is more than a hundred dead, injured, and missing. -The destruction of 30% of forests and 90% of vegetation and pastures which controlled the water flow in rainy days. – Transforming the natural lands to agricultural lands and building luxurious villas on them, to the benefit of the regime’s elements. – Nonstandard constructions on the riverbeds and riparian zones; such as the North Highway that made fundamental changes to its regional ecosystem. That plan was on the agenda just because of financial abuses. Mrs. Maryam Rajavi, renewed condolences to the affected people and called on the public to cooperate nationally to save the besieged people in flood, to find the missing and help the injured. She called on all people, especially the youth, to confront flood and its catastrophic consequences by creating popular councils in each city, neighborhood and village as the only way to overcome the effects of a devastating flood. Mrs. Rajavi once again emphasized that the capabilities of the Revolutionary Guard Corps and the Basij, the army and government apparatus stolen from our people should be made available to the people in order to repair the destructions themselves and to prevent the spread of destruction.